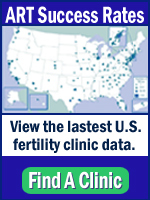 The success rates for IVF treatments are tracked by the CDC, with actual results reported by U.S. fertility clinics performing assisted reproduction therapies. Patients can view ART reports online via the CDC. The number of births via ART is a small percentage of the total, but use of the technology has doubled over the past decade. Today, more than 3% of all infants born in the U.S. are conceived through ART. Success rates vary, by different types of infertility diagnoses, by type of embryos used (fresh vs. frozen, the age of the egg donor, number of eggs transferred, history of IVF and other indicators. The CDC keeps statistics on number of singleton live births, total live births and pregnancies. DFW Center for Fertility & IVF participates in the CDC’s reporting program, and will be listed on the Find a Clinic directory. Our individual clinic success rates will be available online via CDC reports as we gather more data and results from our patients. All information remains completely private, of course. To set up a consultation with fertility specialist Dr. Victor Beshay, and learn more about in vitro fertilization success rates contact us online or call 469-854-0305.